Join the discussion on our forums! Come discuss Fandral Staghelm over in our dedicated Fandral Staghelm discussion topic. 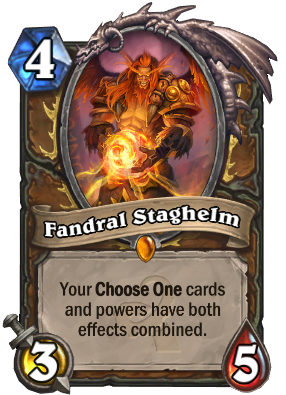 I really hope Fandral Stahelm will be changed into a Classic card one day. Because he's one of my favorite legendaries. Over the course of the last 2 months of 2018 I had gathered enough gold to craft 2 legendaries so I compiled a list of every legendary I would want from both wild and standard (Post Witchwood) and I came to the conclusion I really really wanted Fandral Staghelm along side Zul'jin. He is just that cool of a card. Everything about it is badass, I just need to get a few more Druid legendaries and epics to make a viable Jade deck in wild to use him with :/ I don't really play druid, but Staghelm was the card that I've always wanted to have from the class, him and him alone. It's possible to Fandral Staghelm stay with us in standard after Year of Mammuth (go to classic)? They said, than in future some cards from expansions can be transferred to classic set. Any idea to better designed card? Many druid cards are "choose one" so I'd see Fandral staying. Gets removed every single turn after I play him. Can't really blame them. Fandral it's a must kill because he's just too good. Why, oh why did I wait so long to craft this guy? Makes druid great again! For those of you who were questioning whether to craft this guy or not... do yourself a favor and just go ahead and disenchant that golden Cho'gall or Millhouse Manastorm and make this guy. If your concern is that he will be eliminated by a removal spell, worry not because the tempo this guy brings is phenomenal and he strikes the fear of the firelands into their hearts. I agonized whether to craft him or not, but when I did... Whooo weee boy did I ever have a good time playing Druid again! 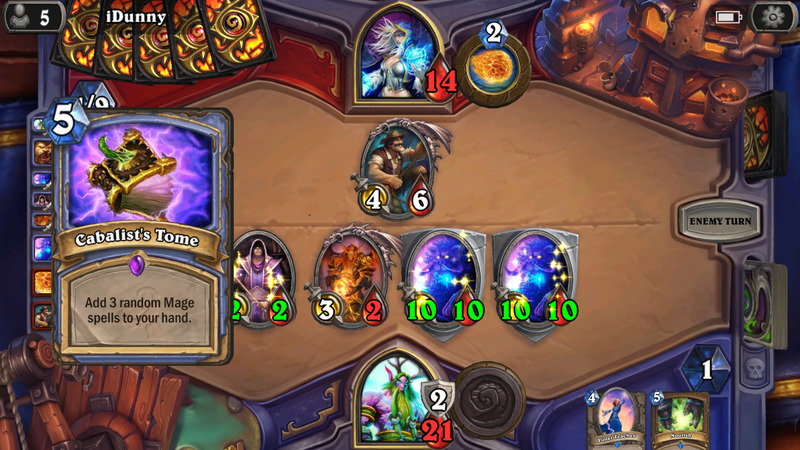 Working wonders in my token and jade druids. 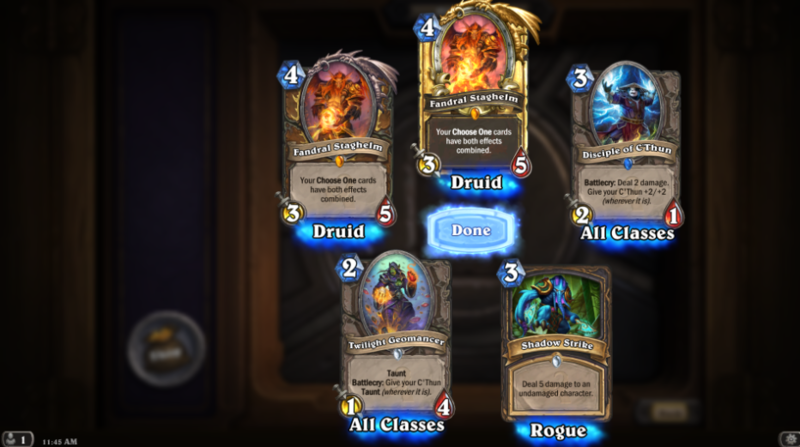 Worth every ouce of dust, I dunno why I didn't craft it earlier. I opened him in a pack today! Great addition to my Druid, and gives me an excuse to play Illidan as well! Jade Idol: Summon a Jade Golem, shuffle 3 Jade Idols into your deck. If I have any of these wrong, could you please comment? Thanks.